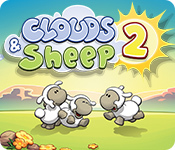 Clouds & Sheep 2 is rated 2.8 out of 5 by 10. Rated 5 out of 5 by LYRANSTARGATE12 from Not for me -but very well done! Although I don't care for this type of game, I'm giving it 5 stars because it is so well done. I love the colorful and humorous graphics. Who doesn't love fluffy, little sheep? ha ha. I had fun for a little while trying out the various buttons, to see what would happen, but then had to stop as the game no longer held my interest. I'd love to see such fun and colorful 'sheep' graphics if it were a building/time management game. But, I want to clarify that the game is 5 star worthy for its genre. I believe those who like this sort of gameplay are going to really appreciate Clouds and Sheep 2. Very well done on this developers. Rated 4 out of 5 by fluffitude from What a cute, little game A nice refreshing change from the usual HOGs, match 3s, etc. You have tasks to complete and just from the one hour I played, seems there is plenty to do. One thing that is bothering me is that it has tasked me twice now (in the first hour) to share a screenshot. Screenshots are easy, but it doesn't explain how to share nor is it obvious (have checked all the menus/options). You cannot refuse the task so it sits there. What if I don't want to share? I mean, really, who cares? seems an obvious grab for free advertising from the game. For that, I removed a star. But other than that, it's a buy for me. Rated 2 out of 5 by Eveoflove from What was that about? Review based on 45 minutes of trial. After spending 45 minutes following the instructions of the tutorial, which seem to want me to learn even more stuff based on all the possible actions, I couldn't come up with a reason for wanting to do so. Clicking on heads to rotate sheep, click and drag to make them jump, click and drag on their tail to make them roll... just not how I like to enjoy myself. The graphics were colourful and cute, but the tasks just didn't attract me. It's a "nope" for me. Rated 2 out of 5 by Kafinkee from Boring! I agree 100% with Pennmom. Cute game but boring. Not much more I can say. Rated 2 out of 5 by JeansLady1 from Is That All There Is? I couldn't make enough sense out of this game to want to buy it after the trial period. I did all the things the tutorial told me to do and it was pretty much a boring game. I couldn't figure out what to do after all of the hints and tutorial help. From the looks of the information on the left side of the game, there's a lot to do; but I couldn't get far enough in an hour to use any of it except for one or two in some of the categories. I think it was just too boring to pursue past the hour's play. The graphics are very good and the sheep are so cute - but is that all there is? I'm disappointed because it looked like a really cute and different game. There needs to be a bit more action or it needs to be clearer how to do more than just roll the sheep around by snapping their tails or make the clouds rain or lightening strikes or having the sheep eat grass or shearing the sheep. I have a free game coupon, but I won't be using it on this particular game. Rated 2 out of 5 by pennmom36 from CUTE GRAPHICS BUT THERE'S ONLY SO MUCH SHEEP-ROLLING I CAN HANDLE This is a Virtual Sheep Farming game but it doesn't have a lot of actual virtual farming quests. It's mostly chock full of gimmicky and cutesie features, but there's only so much sheep-rolling I can handle. Once you get past the tutorials that throws everything at you at once, it quickly becomes boring and the cuteness wears off. The Quests are attached to floating balloons that are constantly in the way, as you finish the quests, you level up and even more balloon quests are added until balloons fill the entire screen and take away from the cutesie scenery. They can be moved around and they remain opaque until the quest is completed, but for me, it was just an annoyance and I just wanted to pop them all! You begin the game with one pre-named Sheep, it would have been nice to be able to name him whatever I wanted, or at least choose the pre-named sheep I wanted. Eventually, the bachelor pre-named sheep decides to settle down and search for greener pastures and Mr. and Mrs. pre-named sheep decide to share the pasture, I'm sure you can guess where this scenario is heading. It's not long before you have a full-fledged herd of pre-named sheep! You can tell each individual sheep which direction to move in, and you can drag them to tufts of grass or flowers to feed them. You can bounce them, send them leaping through the field, roll them all over the field, you can even pull and snap their tails. 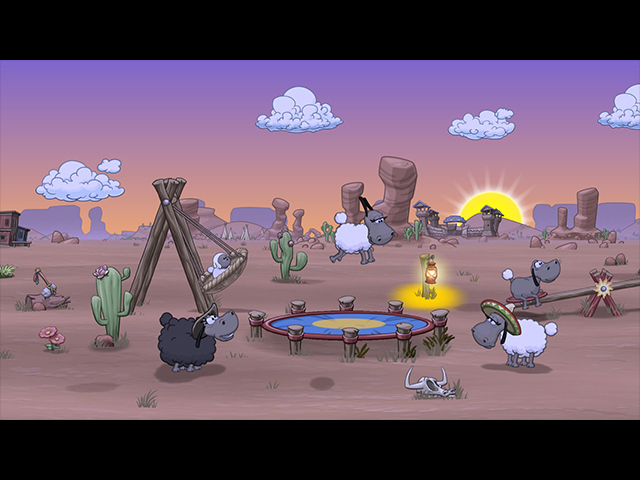 For some odd reason, this makes the sheep happy, and happy sheep reward you with a Happy Star which is used to buy various items from the random Treasure Chest on the bottom right of the screen. The more quests you fulfill, the faster you will level up, and leveling up rewards you by unlocking more cutsie sheep related and non-sheep related items, including seeds, grooming equipment, paint, farm equipment, and even more pre-named sheep. You can collect Wool from the sheep, logs from trees, petals from flowers, and expand the pasture's parameters. To grow more grass, and water purchased seed to grow trees and flowers, you need to grab clouds and merge them to create rain, small puddles will grow grass and water plants, larger puddles will allow the sheep to drink from them. 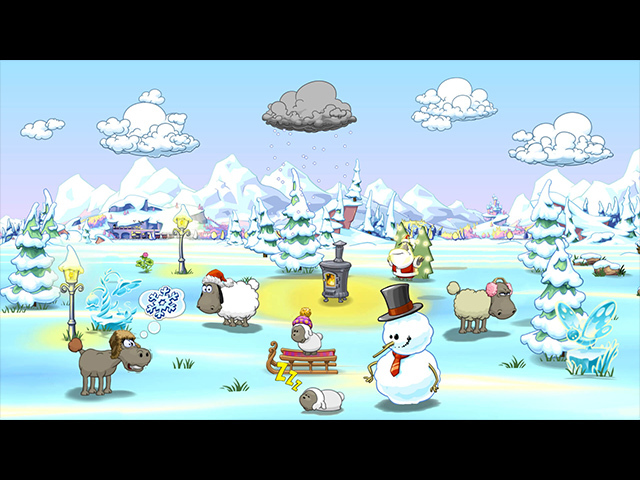 Eventually, you can combine large clouds that create thunderstorms (snow in winter scenes) to create lightning which will destroy dangerous items such as poisonous mushrooms. There are 26 Achievements to earn and several different Worlds to unlock as you progress. Winter Wonderland, Treasure Island, City Park, and the Prairie. 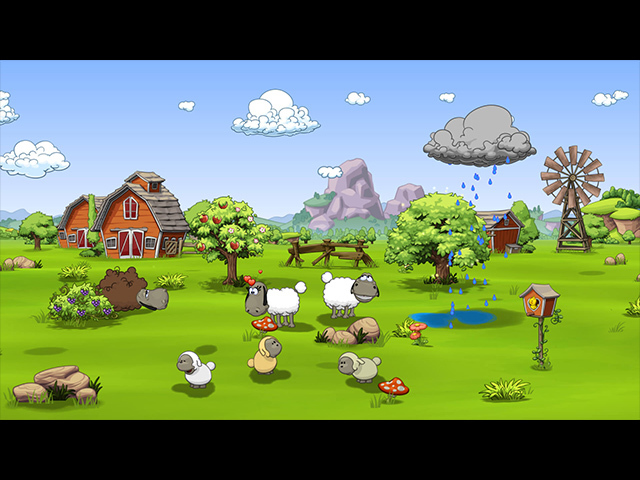 As I said before, this is a cute game with adorable sheep that need some basic virtual needs. Unlike other Virtual games, it doesn't continue on in real time, and I don't believe anything will die if not cared for properly, so after a while it just becomes boring. Rated 2 out of 5 by joybelle_1 from Tedious and boring This game may suit children to initiate them into sim games. But after playing the demo I simply found it slow and tedious. It has a lot of bells and whistles and things to keep track of, such as medicine, food, water etc, and you must keep your flock going, manufacturing rainclouds, feeding them, sheering them, buying more stock etc. But to be honest I think my flock would end up neglected from me falling asleep. This game was more boredom than fun. I think once again adapted from the FTplay phone market. It may just pass as ok on that medium. Only one profile, and simply not good enough for large screen, or those who like things to move along. Not a buy for me.